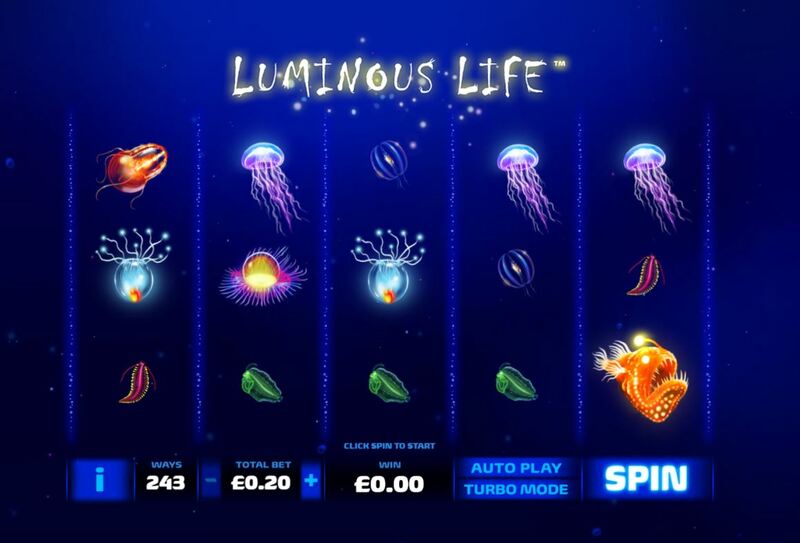 Luminous Life slot is actually as strange as the deep ocean creatures it displays on the reels, all of them having the quality of bio-luminescence. Yes, I watch the nature documentaries so actually know this word which is why I can also attest that the theme here is quite accurate and very well executed, with the symbols actually rising from the bottom each spin with lots of bubbles and the matching sounds. This tells you that deep water forms the background and the graphics are a bit more serious than how Novomatic's Sea Sirens or Playtech's Great Blue are presented. Will these creatures and jellyfish be able to sting your bankroll though? There are 243-ways to win on Luminous Life so you get 15 individual tiles over a 5x3 grid each with no paylines. Now despite my interest in these kind of documentaries I simply cannot recall the weird names of many of these odd beings so it's best I refer to them by colour when citing their 5-of-a-kind pays! You get a Wild which is 12.5x your 20-coin bet then the Orange Fish 5x, Red 2x, Yellow 1.5x, Clear and Jellyfish 1x with 4 distinctly smaller creatures paying either 16 or 12 coins. Your free spins scatter, like the rest of the symbols aside from the Wild can theoretically land in all 15 positions. We have the same format as games like Jack Hammer and Barber Shop Uncut here as any winning combination stays in place with respins until no more winning symbols appear. This doesn't count for free spin scatters though. When you see 3 or more green scatters in view, you will be rewarded with 5 free spins. There are no retriggers possible but all the scatters you triggered free spins with will remain in place as Sticky Wilds. 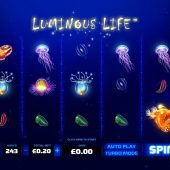 This can be a double-edged sword as if you have them on say 4 reels, then the respins will be very limited as you cannot help but immediately get virtually all the ways possible on the very first spin. There is a special prize though if you trigger the bonus with all 15 scatters - you'll simply be rewarded with a very big prize equivalent to the maximum possible free games outcome! The rules don't elaborate on this but I can only assume it's 5 spins with a full screen of Wilds. I make that over 15,000x bet but bear in mind that's my interpretation only.